Bill Lee, my driver on ERV 1166, is a great team leader. He’s about 55 and is from Seattle. He’s sort of a Red Cross veteran, having worked with his wife on Hurricane Dennis in Florida. He loves being an ERV driver, and is also very conscious of the safety and comfort of the support people in back. He yells out every turn and bump before they happen, and always jumps in the back to help prep meals when we get slammed with people. (As I wrote about earlier, he also knows where all the blue-water Port-a-Potties are scattered throughout the route. Bless him.) He’s relentlessly positive and just has a great attitude. At this point, after two weeks together, we’ve developed a real rapport. We have almost perfect division of labor, with him handling the driving and condition of the ERV and me running the back area. He lets me train new support people and basically follows my lead in that arena. The larger decisions about the route and ending the day’s run are left to Bill. We work well together. I like his style on the loudspeaker too. As we drive through the neighborhood, he calls out the menu, adding little flourishes to make it entertaining. The other night we had ham and sweet potatoes, so his riff went something like this: “American Red Cross with your free Dr. Seuss hot lunch today. We’ve got ham and yams served in a clam by hand by two guys named Sam in the back of a van. So come as quick as you can!” Corny, yes, but any bit of humor helps keep the day moving. He’s also got one about using the Port-a-Potty. Something about how the “soap” in the “sink” in there “just doesn’t lather up.” You have to be as intimately familiar with the Port-a-Potties as we are to get it. And then there’s the one he’s told about his day off and how he got thrown off a public beach for wearing his thong bathing suit the wrong way. And of course he never passes up the chance to remark — whenever we have a woman as our third team member — that she has us out-numbered, “one to two.” What a riot! After the tenth time you hear Bill make the same joke, it starts to drive you crazy. After the 50th time, it becomes as soothing and familiar as a bedtime lullabye. Anyway, I can truthfully say Bill has made every day here easier to get through, and I’m thankful we ended up together on the same ERV. Josh, I had no idea you were doing any of this till now. Dude, you’re a shining example for cartoonists everywhere. I’m proud to know ya. I mention cartoonists mainly because we tend to be observers (much like “The Watcher”) who react to the world on paper rather than in person. Then again, most non-cartoonists are also Watchers (of TV) who rarely have the motivation or opportunity to react to what they’re seeing (unless voting for the next American Idol). So I correct myself: you’re a man among men (not just cartoonists). Bill Lee reads like a perfect Joe R. Lansdale character. I gotta get you MUCHO MOJO and THE TWO-BEAR MAMBO. Hmmm. I see what you mean, but Bill has no discernible dark side (tho’ he does race Corvettes). you actually already bought me Mucho Mojo some years back. Entertaining diversion but not really my thing. Thanks. Is Bill Lee _SPACEMAN_ Bill Lee, the baseball pitcher? Wow! If not, sounds like a swell guy, anyhow. I nicknamed him Spaceman b/c he’s got the same name, but he ain’t the same nutty left-hander famous for pitching for the bosox in the 70s. can you imagine if he were? how cool would that be?! I have worked with this Bill Lee for over 25 years. He is a very good friend, and you experienced the real Bill Lee. He is a very special one-of-kind guy. Your comment regarding his repetintion of certain lines is right-on. Although I can quote many of them verbatim, I always smile when I hear them again. As a teammate, there is no one better than Bill. Wow, so cool to hear from someone who’s known Bill for so long! I gave him the details on this blog and he said he’d check it out when he gets back home, so I hope he corrects any facts I may have gotten wrong. Everything I wrote about him was in the spirit of true admiration. Just wondering: how’d you come across the blog? Thanks, Josh, for what you’re doing here. I think you’ve done a great job with your log, capturing the spirit of what we’re trying to do. I especially appreciate your insights in the 10/27 and 10/31 entries… these are real folks looking for a hand-up, not a hand-out. I took the liberty of sending a link to your log to a few of my friends and co-workers. I think they can get a better sense of what’s really happening from your work here than anything else I can think of. Thanks also for the kind words in the 10/29 entry. I enjoyed working with you and would be proud to do so, anytime, anywhere. you made it back home too, i see. welcome, welcome. thanks for the kinds words. much appreciated. it’s good to know i didn’t grossly misrepresent what was going on down there, at least not from your perspective. i totally agree with you about the hand-up-vs-hand-out issue. 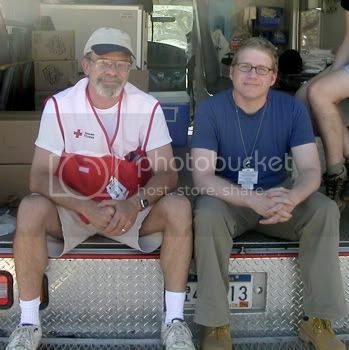 it was my privilege to work with you; to me, you exemplify the best the Red Cross has to offer. p.s. did you get that CD i left you with photos from the area? did it work in your PC? I live in Biloxi and I too have read every entry Josh has made in his LJ. I can tell by reading that he’s a very intelligent and gifted writer. I was enthralled by each entry. I have a unique perspective to his other readers as I happen to be one of the survivors you and him came to help. I can’t remember the last time I enjoyed reading LJ entries as much as I have this evening. I’m glad to read that you all have made it through, and like every one else on the Gulf Coast am very appreciative for everything you and the Red Cross has done for us. The impact you made will be very positive for a long time. I’m also very pleased to read how Josh’s experiences here have opened his eyes and mind to how Mississippians live and act together. I noticed that he was really surprised at how black and white folks lived side by side. I’ve never been out of the southeast US so I’m not really up on how things are in the north east, but this is just normal here. Nothing is segregated, and hasn’t been well for 30 years (I can’t account for the first 4 years of my life). I grew up with black and white friends, and we have a strong asian community in Biloxi as well. Many races living together and for the most part without incident. I’m just glad he was able to experience this and see that we’re not all racist or narrow-minded. This was definitely one of the main things i’ll take with me from my time in Gulfport. My experiences with “northern” cities like New York, Chicago, and San Francisco was quite different. As a kid in S.F. and N.Y.C., my parents made an effort to send me to multicultural schools, and i grew up with tons of Asian, Hispanic, and Black friends, but other than certain enclaves like San Francisco’s Mission District or Brooklyn’s Park Slope, most neighborhoods in those cities were very segregated. Where you grow up, what cultures and people you’re exposed to, are integral in forming your feelings later in life. In any case, my observations of the communities of Long Beach and the VFW neighborhood of Gulfport were very different than the stereotypes of Southern life we are fed up north. When this place gets back on it’s feet and things return to a normalcy you should consider taking a trip here to visit. Enjoy the beach, visit the barrier islands, visit New Orleans when the population has returned and the excitement of the nightlife has been revived. I don’t know how you feel on gambling but the casinos have much more to offer then gambling. High class world renowned shows. Oh not to mention some fairly large sci-fi/fantasy/comic cons. I can attest to the fact that you didn’t witness this place at it’s finest by far. I’d give it a year or so. Certainly glad to hear that the stereotypes were squashed. I run into this all of the time being in the ISP/IT Field I’m deeply involved online and have several friends all over the country and a lot of them have specific opinions about me when they find out I live in Mississippi. I’m not the redneck sheep loving inbred hick you’ve been told resides here. I haven’t seen that documentary, but DMC is the man. I still remember the only time I saw Run DMC live. It was long after their heyday in a small club and they still rocked the crowd like nobody’s business. when does henry meet phoebe?